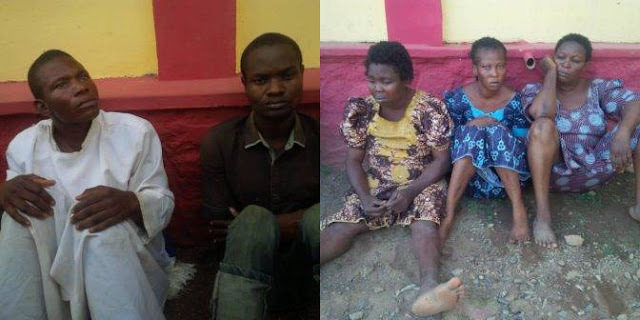 The Ogun State Police Command has arrested a prophet of the Cherubim and Seraphim Church and his accomplice for allegedly killing a woman for money-making rituals. The prophet, Darasimi Rotimi and his accomplice, Ibikunle Sunday were paraded on Tuesday before newsmen at the state police headquarters Eleweran, Abeokuta, by the state commissioner of police Iliyasu Ahmed. Ahmed told newsmen that the suspects killed her and “dissected her body before burying her remains at Alafia street, off Alagbole, Ijoko. The second suspect, Sunday, a 40-year old Okada rider, confessed to our reporter that he killed the victim by hitting a plank of wood on her head. “I hit a plank of wood on her head. When she died, we now shared her parts. I took her head to Ogo-eri and Darasimi (referring to the Prophet) took the other parts of the body away. They said the parts are essential ingredients for money-making rituals,” he confessed. But the prophet from Cherubim and Seraphim Church, Ijoko, denied involvement in the act. “Don’t mind him. He is just lying. If you commit an offence and confess your sin, God will definitely forgive you. I regret my action. I hope the government will temper justice with mercy,” Prophet Darasimi pleaded. “I don’t know anything about the incident. I am ready to die,” he added. Also paraded were three women, Abibat Oyesanya, Morenike Shittu, Olubunmi Funke arrested for child stealing and kidnapping. Funke who confessed to have sold her three-year old daughter for N280,000, said the money was used to off set her debt. “I gave out my three-year old daughter to Abibat Oyesanya who is into local adoption business. She promised to allow me to visit my daughter once in three months. “I am a prostitute. I started prostitution after my first husband sent me packing. So, I decided to give out my daughter to a woman who gave me N280,000. I used the money to offset my debt. “The woman also requested for more children due to the increase in requests by those adopting children. ”That is why I kidnapped the baby girl in Bodija, Ojurin, Ibadan, and brought her to the buyer,” she narrated. The state police commissioner said his command was poised to flush out criminals in the state. Also paraded were 10 suspected armed robbers, including a female robbery suspected arrested for allegedly terrorising Mowe-Ibafo. The suspects were identified as Abiodun Rasaq, Saheed Adebayo, Omisore Kayode, Oyemomi Rasaq, Ridwan Moruf, Mohammed Adefemi, Bala Idris, Abeeb Rasheed, Fatai Abiodun and Bosede Oguntoye (female). A pastor identified as Olotu Oluwakayode who allegedly diverted N17.8 million belonging to a complainant into his bank account, was also paraded.